Rating from notes, 2012: 750ml bottle picked up at Cora-Forsbach. Pours out a light amber color, thick, creamy head, chunky lacing. Aroma brings forth Belgian yeast, pit fruit, some light pastry sweetness. Taste is more of the sweetness up front, light brandy notes, rich, deep malt character, some of the alcohol making itself apparent. Taste lingers for a bit, with a bit more of the alcohol heat warming the gullet. Really solid. Makes me miss my monthly trips to Cora. Clear golden color with a lot of sparkling bubbles seaking the sky. Three finger high, white, foamy head that leaves lacing on the glass. Nose: belgian ale, yeast, honey, sugar, green apples, pears, lemon and a bit of orange. Taste: Complex taste of marzipan, citrus, lemon curd, orange, sweet caramel malt, pears and banana. Medium body with high carbonation, almoust like Champagne. Soft texture. Feels luxury and classic! I like this! Pours a beautiful good. Nice big pillowy head, snow white. Sticky, thick lacings last throughout. Lively carbonation. Big yeasty aroma. Honey and strong light fruits (apple, pear). Bit of an alcohol punch. Big taste too. Very yeasty with some nice minerally compliments. Sweet, sticky fruit. Surprising continental hop presence coupled with some welcome barnyard flavors. Not particularly drinkable, but by no means unpleasant. Only points deducted are based on style really. This could easily pass as a Pale Ale, but lacks the clean drinkability of a bier de garde. A translucent light brown/amber ale drains from the 75cl bottle into a burgundy glass, splashing around creating an off-white blanket of foam. I get heavy curtains rotating the glass around a bit. T One hell of a savory ale this one, it doesn’t wear off at all, no matter how many mouthfuls I have. Plenty of marzipan again, dotting along the line is pears, perhaps more like calvados, it’s all sweet and some malts. Although a raging 10% ABV this only adds to the flavor rather than drawing attention away from it. M Mid to full body, an abundance of beautiful and stringy bubbles. The carbonation stays alive through out the drinking experience, which is fantastic. True and solid craftsmanship at its best. This 2011 version of the brew was chiselled from one good old block of Belgian brewing history and tradition. All things in balance, the only thing that perhaps draws down the rating on this ale is the lack of innovation. The beer is clear orange with medium bubbles, a high nearly white meringue-like head that settles slowly leaving loads of lacing. Some curtains. Smelling sweet fruity, ripe apples, pears, pomegranates, some earthy aromas and a dash of vinegar. The taste has a complex picture, and feels "old time", initially sweet, caramelized sugar, some lemon curd , still that dash of vinegar, bitter lemon zest. Mineral water with chalk. Medium high carbonation, foamy bubbles, medium body soft texture but a rather coarse bitter tang when finishing off. The 2010 vintage. Has complexity, hides the alcohol well, but a bit to sharp bitter finish. Pours up orange and bubbly with a big creamy head that lingers and leaves lacing. Smells of citrus and yeast and and floral notes. The mouthfeel has creaminess along with the agressive carbonation. Tastes malty with sour notes and funk. Some orange and banana in the taste. A nice sipping beer but the ABV reduced my productivity after this business lunch. An impressive beer but a little pricy for everyday drinking. 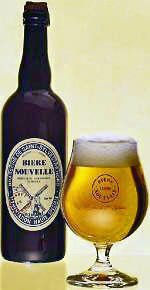 A - Blonde colour, bright, medium carbonation that produces a rocky 3 finger white head. S - Yeasty, lot's of orange and a mild alochol note. There's also a lager element there, possibly noble hop. Smells very fresh and farm like. T - Odd flavour. I haven't had many beers like this. Sweet. Mild Lot's of yeast and the alcohol comes out again mildly in the finish. I can't pinpoint many of the flavours but it's tasty. M - Smooth, really carbonated, medium body. D - Alcohol is masked fairly well. Not overly complex but still interesting and makes me want to work to figure this out. My girlfriend described it as 'chuggable'. A - Nice golden colour to the body, with some haze and a rich foamy white head. S - Noble hops on the nose. Some fruitiness, some herbal notes, and a bit of toffee. T - Fairly yeasty, with a moderate hop punch, followed by a bit of sweetness, some apple fruitiness, and quite a pronounced alcohol taste. Some bitterness in the after-taste. M - Medium-bodied. Quite highly carbonated, and quite boozy too. Not too pleasant. D - Judging from the one bottle I had the drinkability is pretty low. This beer will surely warm you up and inspire some hearty conversation, though! 75 cl exclusive-looking brown bottle. Label in beige and blue with a pic of a wind-mill. Steel cage and natrual cork. A: Slight hazy and light copper pour with a fluffy, enormous white head. Slow dissipation leaves lots of lace. S: Yeast, green apples, malt and faint citric notes. Spices. T: Yeast, fruit, malt and spices. M: Body is creamy, smooth and light. The carbonation is smooth as well. Rather short aftertaste. D: A little to discrete to get a higher grade, but a refreshing beer never the less. A: Light orange color with the most insane head I've ever seen. Off white and very very creamy head. Lasts a LONG time with lots of lacing. S: Lots of yeast like smells: funky sourness and tart. Nice sugary malts. Tons of dried fruits: fig, plum, etc. Banana is prominent and some spices : cloves, pepper, cinnamon. A bit faint though. T: Starts up with nice sugary malts: tons of honey and brown sugar. Some tart there too. Then it's all about fruits: bananas, dried fig, green apple, cranberries. Some spices there too: cloves, cinnamon and a bit of pepper. Very spiced/fruits bread kind of feel to the brew. Ends up nice and dry with some piny hops. The alcohol is there and warms a bit when it goes down. Complex, but it doesn't blew me away too. M: Very average. Even there seems to be A TON of bubbles, it's not that bad. I find the brew a bit watery for a 8% brew, but it's not that bad too. D: It's high. I could drink another of this. It's a very balanced brew, making it easy to drink. But since, it's a style that is normally easy to drink, I won't score much higher than a 3,5.